A major overnight search involving 80 volunteer mountain rescue team members ended when two missing walkers were found at their car. Langdale Ambleside Mountain Rescue Team was called out at 9.40pm on Thursday after the men were reported missing in the central Lakeland fells. The Langdale team was joined by colleagues from the Keswick team, Lake District Mountain Rescue Search Dogs, along with Wasdale MRT in looking for the walkers lost on their way back to Langdale from Scafell Pike. A Langdale team spokesperson said: “The initial search took place in appalling weather with strong winds, low clouds and heavy rain and sleet. “When all search plans had been carried out by 5.30am, the search was scaled down with a view to catching a nap, and some food and drink and scaling up. The missing walkers were found by a dog handler at their car about 1.30pm on Friday, after finding their own way off the fells. The spokesperson said: “They were cold, wet and very tired, not unlike most of the searchers. “They had spent the night near Green Hole, climbed out over Bow Fell at first light and made their way off. Were this pair of walkers known to be ill-equipped or vulnerably frail? If so I can understand the urgency and scale of the response. If not, then fending for themselves until the following mid-morning seems to me reasonable, based on my personal experiences. In these conditions a bothy and a good selection of spare warm clothing and calories would be needed at least! If the walkers were wet, (and it seems they were), the situation would be worse. For example, if they were cragg fast on an exposed slope. Given the appalling under-preparedness of most “walkers” in our wilder spaces, it seems very appropriate to me. In addition, the noddies didn’t even contact MRT or the police to explain they had made it to safety, (unless they had not had the chance). I would guess they had cheep tat clothing & equipment and no real mountain craft, so good effort MRT, hope you don’t get many more of these! This could have been yet another tragedy story. Yes, I read the article, and I too, have made a nonsense of navigating in similar conditions between The Corridor Route and Great End) (but in November) with two companions and made the decision to drop anchor and wait for daylight. Most of the responsible people in the hills KNOW that sooner or later, they will get things wrong and are prepared to accept the consequences of an uncomfortable night out. I'm sure Lake District MR volunteers are very grateful that you chose to sit out the consequences of your past error. I'm sorry that I reacted in an 'over-the-top' and 'unnecessary' way by making the decision to call out around 40 volunteers to search for these two guys. If you'd care to provide 24 hour contact details, then I'll run all my future decisions past you for approval. A second wave of about 40 turned out again in the morning. Some people dashed straight off to work when they got off the hill at 5:30am. The other thing I did regularly through the night was update one of the lads’ mothers, trying to reassure her that they would be ok. She was very upset. She cried when I phoned her to tell them they’d turned up OK.
People affected by these incidents aren’t just the people on the hill. For the record, they had been in the car for a matter of minutes when the dog handler returning to his car noticed the steamed up window. There is no signal in the car park. They were clutching the note left on their windscreen requesting they call police should they return to the car before they were located. I’m back off to bed now, having been dozily browsing the internet while drifting off to sleep and finding myself sufficiently bothered to get back out of bed to write this. Many of the same volunteers who were out on Thursday night were also out on Fridayafternoon, Friday night, and again this afternoon and tonight. To the best of my knowledge, none of them have questioned the decisions to turn out. I am confident that these two young men will be out in the hills again, perhaps with better waterproofs, better torches, a little wiser and perhaps a little less ambitous following their experience and we all wish them well. I could write a lot more about the motivation and sacrifices of the numerous emergency service volunteers, but I won’t. It's now midnight. I need sleep. The following was posted by Nick Owen of the Langdale team on Facebook. We thought it worth repeating the comments here. As MR volunteers we all make choices. The go/no-go decision is one which team leaders and search managers take seriously and which are informed by the information we have to hand at the time of the callout and this information isn't always made clear to the wider public in real time to judge whether we got it right or not. We would rather go to find the misper snug and warm in a bivvy bag than to not bother and then the following day be asked to recover a body. I am sure (because it's been said to me many times) I am an idiot for being in mountain rescue myself and am actually contributing to the lax planning and preparation of those venturing out who have the failsafe in the back of their mind that they can get rescued for free when it all goes wrong. That's one view of it - however, I would encourage those who wish to sit in ivory tower judgement to wear the shoes of those family members distraught, sat in the b&b or worse still miles away at home, going out of their mind with worry and imagining the worst case scenario. That's why I and many more do what we do. The joy of a family reunited is something to behold and yes we do occasionally feel a bit aggrieved after a long slog around the hills (that normally clears up after some food and sleep) but I would never change it. I live in the area mentioned above and have close friends within the MRT. I am the same as everyone else in Cumbria who are very proud of all the volunteers and the work they do. People do come to the area thinking they can walk the hills as if it is a stroll in the park. Mr Homer I don't think please going into a mountain range, what ever the weather to save lives or make sure people are safe isn't overreacting or over the top. I am amazed by the reaction to this story. The way I read it, this pair didn't raise the alarm themselves so are not directly responsible for the massive search, and may have even been aware that it was taking place. They obviously had enough 'hill craft' to realise that the conditions were so bad that taking shelter was probably a better option than stumbling around and potentially making their situation worse and they were obviously well equipped enough to survive and unplanned bivvy and walk out when the condition improved. But again I, like most others, am just speculating based on a very brief news article so my opinion is, like others, actually irrelevant and you can only congratulate the MR teams for their selfless dedication and leave and recriminations (should they be required) to the authorities. For me this story pales into insignificance compared to the one a few weeks ago where three people called for help themselves, walked off anyway and then didn't bother to contact the authorities to say they were safe, choosing instead to drive home whilst a search was still underway. That one did deserve a torrent of self-rightious wrath. I choose to serve in my MR team. If me losing a few nights kip is the price for people still being able to follow adventurous inclinations so be it. If I ever think my service is being abused by anyone I shall withdraw from MR. Simples. Because I am responsible for myself and my decisions and have no need of a chat room arbiter to advocate on my behalf. I like the fact that young and old people go out on the hill to learn from their own experience, to build up the knowledge to take on greater challenges. part of that process is learning where our boundaries of ability, safety and comfort lie. Sometimes we all step over these with unpredictable outcomes thats why it's adventurous. Well done to the team leader who put it so eloquently. Some say that internet trolls have 'issues' Mr Homer. Your comments are un necessary, ill thought out and deliberately provocative. I am only be grateful that wiser more experienced heads are in charge of the MRTs instead of yours. Suggest you have a read of all the comments in FB and have a think about your internet use. Well done the MRT correct decision and selfless service as ever. Sorry for the reaction and feelings I have aroused, please accept my apologies. Please put it down to over-indulging a past culture. In the circumstances I found myself in, which were pretty awful, both weather wise and in terms of equipment, I should have been mortified if I felt I had put a single soul to the inconvenience of recovering our party when there was no reason to suppose we were incapable of walking out unaided. That tends to colour my thinking and attitude. I read recently the Sir Chris Bonington's remarks to the effect of deploring the risk-averse, non self reliant culture we live in today. I am sure, absolutely sure, that such sentiments are regularly expressed by hill people. This is not the arena to give them voice, so again I apologise. I'm an MR volunteer (not on a Lakes team) and was camping with my son at Stonethwaite on Thursday night. An MR team member rush through the site early on Friday and headed off with his dog into horrible weather and all I could think was "Bloody hell - I'm glad I wasn't on the hill last night - good luck". Everyone can get it wrong sometimes, and sometimes there's no drama. But even in good conditions it can go pretty wrong pretty quickly, in weather like that (the beck had gone up maybe 2 ft overnight and it was blowing hard) it could have gone very wrong a good few hours before - especially considering that the weather during Thursday was fairly benign and walkers setting out then might be differently equipped to those setting out on Friday morning. I'd have been happy (relative term!) to be called out for that situation. Looked like a good decision and a good outcome to me - well done to all. Comment is fair in any forum as are responses. Interesting debate. I strongly agree with Keith that the mountains are a place where we can find out what our limits are, where we can take risks. Thank goodness we have MRTs in case we wrongly evaluate those risks. My great dread is ever having to call out an MRT but I'm glad to know they don't assume any caller is an idiot. I hope I'm not, but I know I could still get into trouble and need help. Glad this matter's closed (or has it?) Till next time someone goes out in trainers, without map, compass, + hasn't a clue? And other folk have to trawl the fell for them at all hours? Please think again, Chris Homer, before criticising anything our great MRTs do, + see it from their side. Good night. As Chairman of the Lake District Search and Mountain Rescue Association serving the 450 volunteers and 12 teams across Cumbria, it heartens me to read the supportive remarks given to our teams. Your positive support for what we do is very much appreciated. I , along with many of my colleagues, regularly get asked by the media to criticise those who go ill prepared and 'waste' our time. My response remains solid; those we rescue get themselves into desperate situations and MR are normally the only ones with the necessary skills and experience who can provide the assistance they need. Yes, sometimes we get annoyed when someone has not learned from their experience, especially when they put others in their party at uneccessary risk, particularly those who are vulnerable, but we all have made mistakes, survived and benefitted from the experience. Those who never make mistakes have probably never achieved anything. As a volunteer in the Wasdale team I will always support the decisions of our team leaders and other leaders across the county. They carry a high degree of responsibility on their shoulders and I have the greatest respect for them. As one of the 40 out on the Friday, I can say that the gills on the high fells were in flood and only crossable with great care. My only thoughts that day were that the two young lads were out there, cold wet and possibly critically hypothermic. 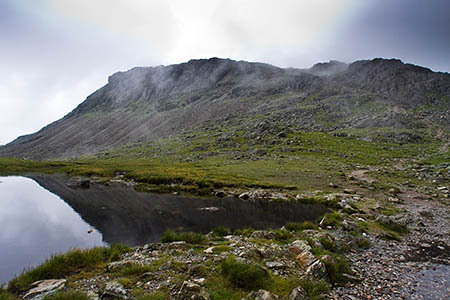 In the search party I was in, all three of us on Scafell summit, being battered by the cold wind and rain, have sons around the same age as the lads we were searching for and that is what drives us on when our legs are telling us to stop. We all have families and friends who could be in the same situation. We were extremely relieved when the stand down came across on the radio later that day. They were down, safe and well. Our job was done, our allocated routes searched, our voices rested after continuous shouting for the previous five hours and we could get back home to get our waterlogged boots stuffed with newspaper and wet kit sorted for the next rescue, which actually came in later that evening. It is a privilege to be part of such a fantastic voluntary organisation. Best wishes to all contributors to this comments thread.